This resource has been sponsored by the Co-operative Education Trust Scotland and is designed for use in primary schools. These clips provide a fascinating insight into the history and values of the Scottish Co-operative movement during the 20th Century. The films and activities are suitable for the upper primary (P4-7) and would be an excellent resource for classes learning about Co-operative learning, Fairtrade, Eco schools, Enterprise, New Lanark, Victorians, WW2 and Healthy eating. The Co-operative movement offers an alternative and successful business model. A co-operative is owned by its members and they have a direct say in how the business is run. The profits are then shared amongst the members and also invested back into the communities they serve. The Rochdale Pioneers are regarded as the first ever co-operative and their model has been replicated across the globe but it is now accepted that there was a weavers co-operative in Fenwick in Ayrshire, Scotland as early as 1761. Evidence of the Fenwick Co-operative can be found at the National Library of Scotland. 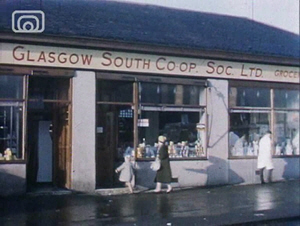 The Co-operative movement emerged in the 19th Century and by the 1960s nearly a fifth (1/5) of all Scots were members of the SCWS (Scottish Co-operative Wholesale Society). Membership has declined sharply since then but the modern Co-operative movement still believes in ‘doing business that is good for everyone’ and is a prominent supporter of Fairtrade and Climate Change campaigns. This is a WW2 propaganda film that stresses the importance of a co-operative effort during the war. The film dramatises the history of the Fenwick Weavers who formed the first Scottish co-operative food society in Ayr in 1769. What is a Spinning Jenny? What is the box for? Why is it so important? Why is it made from the best materials? List the different ways the box helped people who had fallen on hard times? What does wholesale mean? If you buy the flour at a wholesale price why is it cheaper? How are people who have ‘fallen on hard times’ supported in today’s society? What were the evils of the working conditions of the 19th Century? How did the Co-operative movement develop and grow from the 1800s onwards? List the ways that co-operation would be important during wartime? Social Studies: Research the history of the Fenwick Weavers. Compare them with Robert Owen’s society at New Lanark. What similarities and differences did both schemes have in supporting workers and their families? Compare this with the present day. Language – Imaginative Writing: Watch the film up until 03:28 (before you discover the purpose of the box). Continue the story in your own words. What is the box for? What will the men do with the box? Expressive Arts: Working in groups, design and make a grand box for the Fenwick Weavers. It must be of the finest craftsmanship and made with the best materials! Mathematics: In groups, investigate the possible savings between buying in bulk and buying individual items. Research supermarkets’ online stores and compare the prices of single items with their multi-pack equivalent (drinks, crisps, tins etc.). Social Studies / Language: Design WW2 propaganda posters encouraging the co-operative spirit at home, at work and at war. Expressive Arts: In groups, role play wartime situations where co-operation was important. Film the dramas and turn them into a propaganda style film for wartime co-operation. This section introduces the speaker. The speaker says he is fighting for co-operation and not insecurity and mass unemployment. Which people in society do you think he is speaking for and what jobs do they do? Compare this film to Out of the Box (1942). Which film do you think is most successful in selling the message of ‘co-operation’? Social Studies: What does the speaker mean when he refers to the slump of 1919 – 1939? In groups, research the main events that lead up to the start of WW2. Place the events on a timeline. List the events in their order of importance. 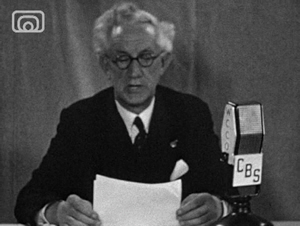 Language: Radio broadcast speeches were one of the most powerful tools of communication and propaganda during WW2. Listen to some more examples here. In pairs or groups, discuss and decide which elements are most important when delivering a good speech (expression, tone, speed, structure, clarity etc.) and collect some examples of persuasive phrases. What makes the clips sound old-fashioned? In pairs or groups, now write your own speech in the style of a WW2 radio broadcast. It could be serious – ‘Why co-operation is important in the school,’ or funny – ‘Why we should build a swimming pool in the playground.’ Think of your own titles. Expressive Arts / Language: Neil Beaton hopes that post war planning will provide the “maximum amount of health and happiness”, to all people. Reflect on this phrase, record your ideas as a mindmap (think of food, sports, holidays, friendships, toys etc.) and use it as inspiration for a piece of artwork, drama or music. Language / Health and Wellbeing: Discuss the pros and cons between the spirit of co-operation (where you are working for the benefit of everyone) and the spirit of competition (where you work to be the best at something, sometimes at the exclusion of others). Work in groups to write speeches and hold a class debate. 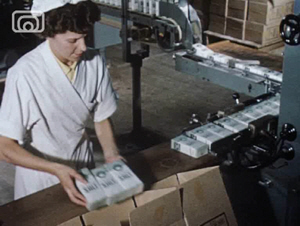 This film describes the modernisation and success of the Co-operative movement in the 1960s. Watch the opening 10 seconds and pause the film. Using the title and music as clues, what do you think the film is about? What does SCWS stand for? Why does the SCWS have a sheaf of wheat as its symbol? Why does the film feature a housewife and not a househusband? List the ‘wide range of goods’ you can see displayed on the shelves. 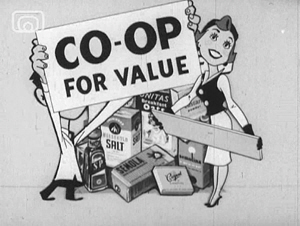 What examples of co-operative shops does the film show? How does the film prove how successful the Co-operative has been? What is a hosiery factory? What is a twin set? Pause the film at 5:28 and discuss the fashions on display. Do you like them? When was the film made? The film describes the tobacco factory as a ‘smoker’s paradise.’ What does it mean and why would advertisers not be allowed to use that phrase today? How is music and technology used to show how ‘proud’ the Co-operative is of their cigarette factory? List the different stages in the making of shoes. Compare the designs, furniture and clothing of the showroom with today’s fashions. Language / Expressive Arts / Technologies: Download the clip and use the showroom sequence (9:08 – 12:00) to add your own narration, soundtrack and sound effects to. Social Studies / Expressive Arts / Enterprise: Compare the film with The Empire Exhibition film. As a class set up a showroom or exhibition to sell Scotland in the present day or 50 years in the future. In groups, plan, design and present your ideas for a specific part of the exhibition or the event as a whole. Mathematics / Social Studies: Survey and make a map of the different shops in your local High Street or Shopping Centre. Survey staff and pupils to discover what shops they use most frequently in their local area. Display your results as a graph. 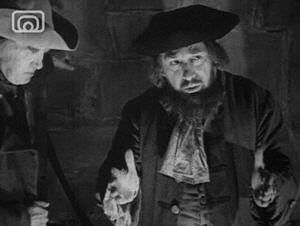 Technologies / Language / Expressive Arts: Watch the film Counter Courtesy (1947). List the jobs shown in the film and compare to Tomorrow Is Yours (1961) and how many jobs you can list in a modern supermarket. Role play customer complaint scenarios in a modern supermarket. Storyboard, script and film a humorous training film set in your own school for how to be a good pupil and teacher. The Chemical Sundries Department is where the Co-operative tested and manufactured its own food products and this clip is a behind the scenes look at what they do. What is a ‘Chemical Sundries’ department? ‘Neat, swift, automatic.’ List the stages of salt production. Why is the salt brand called ‘Snowdrop?’ What other names could you use? List all the food products that you think have a catchy sounding name. Unitas Oats is a fine Scottish product. What other fine Scottish products can you name? Why must supermarkets test products carefully before they reach the shop? Discuss and list all the ways science and technology is presented in both clips. What words does the narrator use to show his pride in the scientists and the production methods? ‘In the kitchen, housewife testing.’ Discuss the role of women in the clips. Language / Expressive Arts: The word unitas in Unitas Oats is Latin for unity. Why is this a good word for a Co-operative product? Rename other food products to fit into a Co-operative theme. Design suitable packaging. Science / Technologies: The narrator says of one machine that ‘you might say that it was almost human.’ What effect did automated machines have on the production and cost of food? Automated machines and new labour saving devices such as the vacuum cleaner and the electric iron were supposed to make modern life easier and take care of all the boring jobs. Is that true? How many labour saving devices do you have in your home? In a pair or group, design a robot that would make life easier for you. Language / Expressive Arts / Technologies: Write a point of view diary entry from the various people you see working in the Chemical Sundries Department. Write a job advertisement for the various people needed to work in the department. ‘In the kitchen, housewife testing.’ In groups, storyboard, script and film your own humorous product testing in the kitchen laboratory; keeping with tone, narrative style and fashion of the original clip. Health and Wellbeing / Social Studies: ‘Chemical Sundries’ does not sound like anything to do with food. The laboratory and machines almost seem more important than the actual food. Compare with Tomorrow Is Yours (1961) and research why affordable, mass produced food was seen as an important advance in the 1960s and why people began to shop less in small local stores and more in supermarkets. How healthy are mass produced food products? Today, we are less trusting of the science and many people are concerned with the overuse of GM foods, salt, additives, E numbers and pesticides in our supermarket food and the effect this may have on our health. In groups, examine the labels of a selection of food products from a supermarket. What are the ingredients? Do you understand what they all are? Find examples of products that claim to be good for our health or low in fat. Discuss. How environmentally friendly is supermarket packaging? What can and cannot be recycled and does this matter? Mathematics: Make a shopping list of 10 to 20 essential household food items. In pairs, research different supermarkets’ online sites to compare the total cost of shopping in the different supermarkets. Where are the bargains to be found? Plan a week’s menu for a family of 4. Can you shop for everything you need on a budget of £100? A varied and entertaining selection of adverts made by the Co-operative. How is sound used in the adverts? Watch some adverts with the sound playing but the screen covered. What images are being used to advertise the product? What year was the advert made? Where would people have watched the different adverts? 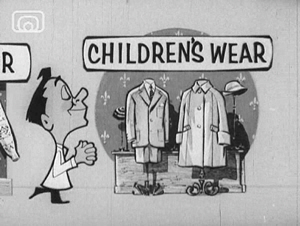 Watch a selection of the adverts. How many advertising slogans or jingles can you remember? Which one is the catchiest? Can you order the adverts in terms of date? Do you recognise any of the products? Compare and discuss how women and men are presented in the various adverts. Puzzles – what things did you not understand? Patterns – were there any common themes between the adverts, in sound, colour, style, characters etc? Similarities – what other adverts or TV characters did they remind you of? Surprises – did anything happen that you were not expecting. Language: Spot the camera shots and storyboard one early example of a Co-op advert and one later example. How do the camera shots differ and why? How does sound and colour influence the effect of the advert? Expressive Arts / Language: Create your own advertising posters and packaging for some of the food products. You could modernise them or keep them in the style of the era. Language: Compare the Co-op selection with modern adverts. What modern adverts appeal to you? What jingles and slogans stick in your brain? Access to lots of modern adverts can be found here. Entering ‘co-op’ into the brand search will provide a selection of modern Co-op adverts. 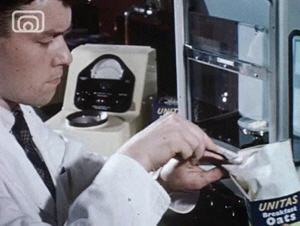 Health and Wellbeing: After watching Co-op Adverts from the 1950s and 1970s - Advert 3 (01:29 - 01:35) Cogent Cigarettes (1950s) watch Meet The Stars (1960). Research and discuss how cigarette advertising has changed over time and why. Can you think of any modern sports stars that help advertise a product? Does that influence your decision to buy it? Food or drink products sponsor what sporting events or TV programmes? Enterprise / Technologies: The Co-op has asked your class to come up with a whole new set of food and drink products. The name of the products, the packaging design and the price will all reflect the Co-op’s firm belief in locally produced food, Fairtrade and being environmentally friendly. In groups, make posters, packaging, animations and adverts to sell your products. Each group could then give a presentation, Dragons Den style, to see which group would be given the contract. Ask the manager and staff of your local Co-op into school to help judge the presentations. Enterprise / Health and Wellbeing: In groups, plan what products and events you would host for a week celebrating locally produced Scottish food. Invite local shop owners or supermarkets to help you. Write, publish and sell a recipe book celebrating Scottish food and local ingredients. Enterprise / Health and Wellbeing: Research ethical trading methods and Fairtrade. In groups, organise a campaign to help make your school a Fairtrade school. You could even set up and run your own Fairtrade tuck shop. This Lesson Guide was developed by Primary School teacher Athole McLauchlan.